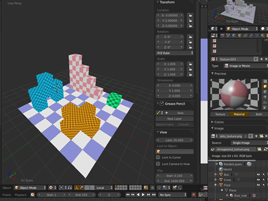 With Atlas3D you can use NGUI ATLAS to texture imported meshes using the same workflow for both UI and 3D content. 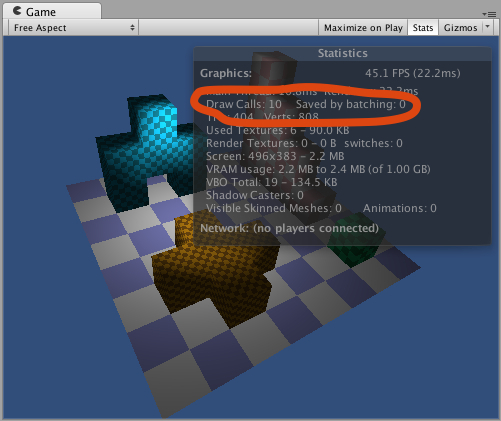 Unity will do dynamic batching on meshes that have not more than 300 vertices, scale of 1 and the same material. 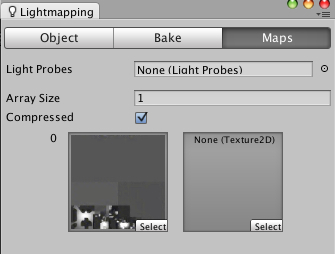 You can add LIGHTMAPPING with Unity Editor but normally it will break dynamic batching. 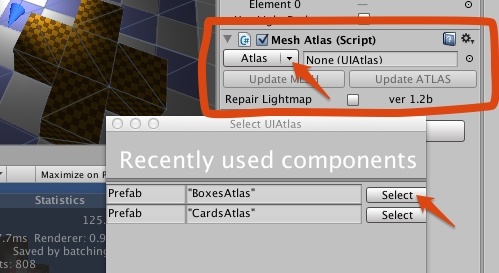 With Atlas3D you can REPAIR lightmapping and still have 1 drawcall on dynamic objects. 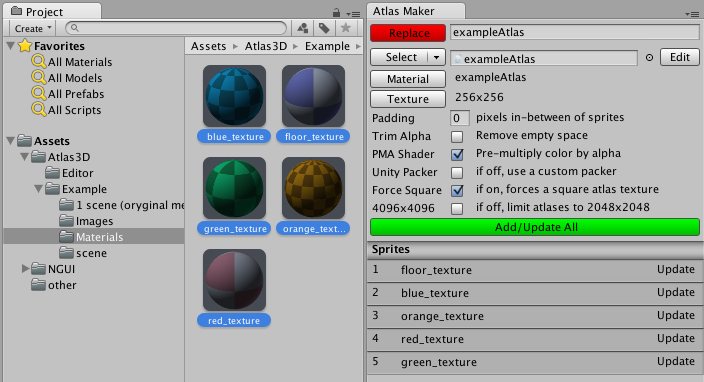 It simply converts original Unity atlas information and modifies uvs on source object. This way you can still use built in lightmapping engine and keep 1 drawcall without static batching on Unity. This method has its drawbacks. Every lightmapped object needs to be unique. So you trade mesh sharing to get low on drawcalls. Atlas3D Toolkit is good for low-poly dynamic meshes in MOBILE games where you need low number of drawcalls. It is useful for building world elements and putting lightmapping on them because they will batch even on indie version of Unity. When you use unlit or vertex-lit shader that needs only diffuse texture atlas texturing gives you 1 drawcall even with big number of dynamic meshes. Skinned meshes are not compatible with the current (1.2) version of Atlas3D because they are simply not batching at all even with the same material as other objects. I am working on a component that will merge multiple skinned meshes into one to keep 1 drawcall. 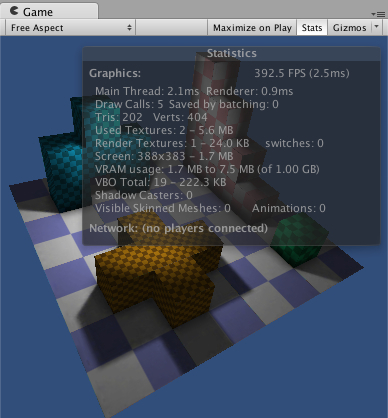 - Unity will render lightmaps to 1 or more textures based on your setup. First lightmap cost zero drawcall. Every new texture will cost 1 additional drawcall so if you can fit on single texture you are good. Adjust "Resolution" parameter to scale the map. - "Update ATLAS" - hit this button when you change or update Atlas. 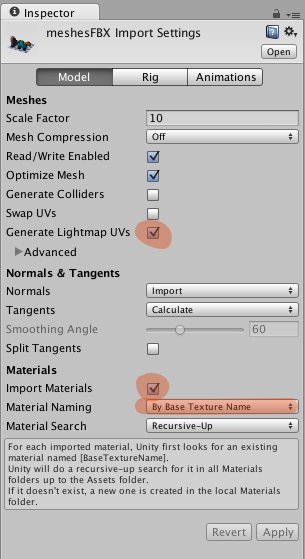 This will refresh uvs on ALL the meshes that use the same Atlas as selected GameObject - no mater which mesh you select script will search scene automatically. - "Update MESH" - Updates all the meshes in the scene. Hit it when you change any of the original mesh in 3D app. 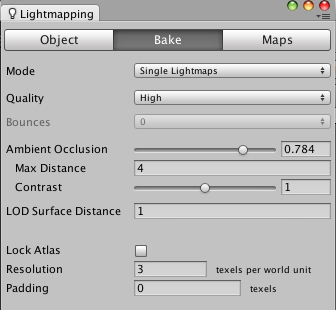 - "BAKING Mode" - every time you will bake lightmaps again hit this button to temporary revert lightmaps just like unity likes to make the rendering. - "REPAIR Mode" - When lightmapping is finished hit "REPAIR Mode" again and it will repair lightmapping to have 1 drawcall. - When something unexpected happens with your meshes on the scene, remember that you can always re-apply import settings on mesh prefab. Especially if uvs will break. This will refresh your meshes and you can start experiment again. - Warning! To clear all the unwanted effects its advised to reimport all original meshes in the Assets in case they were modified by the previous version. - Components are merged into single MeshAtlas component with atlasing and lightmapping option. - Changed the method of uvs modification. Now the original mesh is never modified. Dynamic copies are generated in runtime for all the uvs changes. - Simplified use without "make Unique" function. There are no more errors when meshes were instantiated. 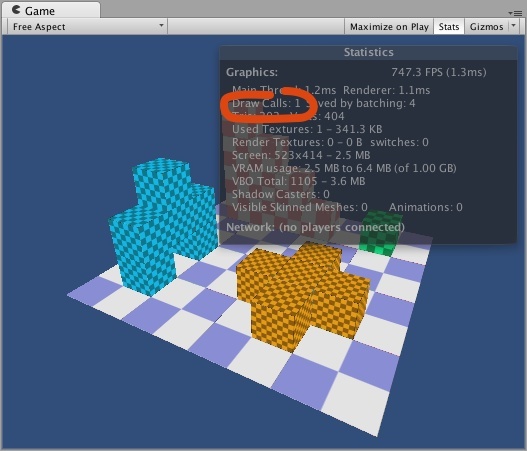 - You can make prefabs from scene objects with MeshAtlas componnet without a problem. 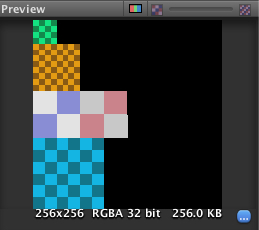 - You can turn off component to display the original mesh with original material. - Multiple objects modification. You can select many meshes on the scene and change atlas, texture, lightmapping options on all of them. - You can put multiple original objects from the scene and there is no strange texture scaling after you put MeshTextureSelect component on them. - Original release of the toolkit. and copyright of Tasharen Entertainment. 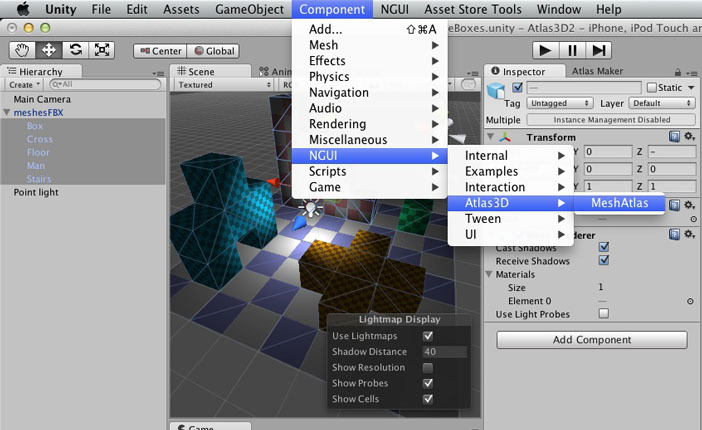 *NGUI is required for Atlas3D tools to work!